Location: Entraygues-sur-Truyère, in the Aveyron departement of France (Midi-Pyrenees Region). 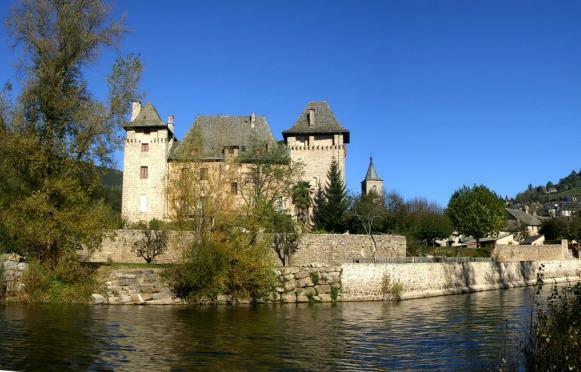 Notes: Château d'Entraygues is a medieval castle located in Entraygues-sur-Truyère in the Aveyron, at the confluence of the Lot and Truyère. The name was written Antrague during the Renaissance. The castle was plundered and devastated in 1587. Shaved partly in 1604, a new main building was rebuilt in the seventeenth century by Henri de Monvallat, new lord Entraygues. Remains of the thirteenth century there is only the staircase, the vaulted room left on the ground floor and two square towers: the Farnal tower (the side of the Lot) Panadèse the tower (Truyère side), dating back to the thirteenth century and fourteenth century and a main building that was built in the seventeenth century.